Medicare Part D costs 2019: In this post, we’ll cover what to expect from Medicare Part D costs in 2019. Remember that Part D covers your prescription drug coverage, and it is an optional addition to your Original Medicare. Call us for any questions 844-528-8688. Keep reading for updates on the 2019 Part D drug costs. As a Medicare recipient, it’s important for you to stay up to date on the changes in costs from year to year. Deductibles, copay's, coinsurance, and premiums have historically risen over time. Especially if you are on a fixed income, being able to budget for medical expenses is paramount. You may not have it, and if you have a Medicare Advantage Plan, you might receive your prescription coverage as part of that plan instead of stand alone Medicare Part D.
Deductible are going up a negligible amount. Your donut hole starts later but ends later too. Medicare Part D Costs 2019 is following the regular trend over the years, the Part D deductible is set to increase from $405 to $415. This means you’ll need to pay and extra ten dollars out of pocket before your Part D benefits kick in. After that, you’ll pay a 25% coinsurance until you hit the Initial Coverage Limit. You ICL is going up too. The hike from $3750 to $3820 isn’t too much of a change, but it does mean that your doughnut hole is starting a little bit later. That would be great if the hole wasn’t also increasing on the other end. Additionally, the legislation dictates that prescription manufacturers must pay 50% of the cost of brand name drugs and your plan must pay 20%. I n effect, this means that you are only paying 30% of the total cost of brand name prescriptions, but 95% of the cost goes towards your spending limit. 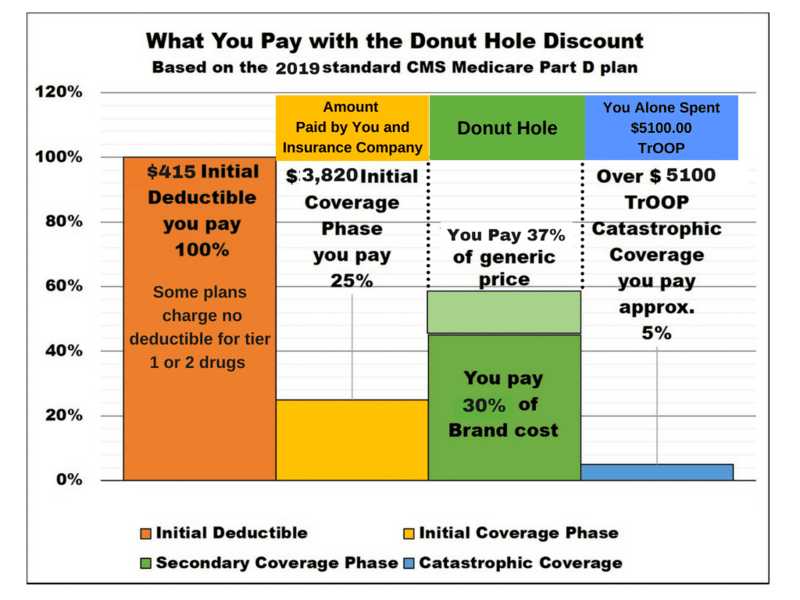 While you might be tempted to frown at the higher deductible, the 2019 forecast for Part D is a benefit to anyone who runs the risk of falling into the donut hole. Not only do you have a little bit more spending covered before you do end up in it, but the new discounts mean that the donut hole isn’t nearly as debilitating to your finances as it once was. Have Medicare Part D Questions? You can email us your questions from our contact us page or call 844-528-8688, there is never a fee for our services.